Nice to see so many responses to our recent post about what we would like to see in Pro Tools 11. You may recall we posted the Pro Tools channel strip hack earlier this year, which shows how to save a channel or channels as presets. This was only possible because it was a feature from Pro Tools SE that someone found had appeared in other versions of Pro Tools, although hidden. Avid are now basing their product development on plugging in code from other Avid products like Media Composer and Sibelius, so in thoery this makes the things seen in other products portable to Pro Tools. Here are a few we know can be done, these are all from Pro Tools SE. 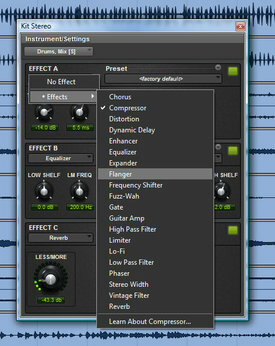 click to enlargeAs you can see from the image above, effects groups are possible in Pro Tools SE - be nice to see this ported to Pro Tools. How many times are you loading the same 3 effects into a channel and then loading the same 3 presets into those effect? click to enlargeWorkspace is car crash if you are trying to find samples and loops, most of all because it nevers stays on top of the Windows when you need it too. Even if it isn’t changed in 11, in SE it does stay on top, even better it has the name Loops - how simple! click to enlargeUsing instruments in Pro Tools can be another laborius workflow, right now it requires the creation of a New Instrument Track, Choosing the VI and then finding the preset. In SE it’s simply a case of choosing new a new instrument and then you get a cool browser to choose your sound - far more like Logic and far more intuitive. It seems entirely possible to use the work done in Media Composer to give Pro Tools 11 better video handling, this would be a killer feature and ensure that it stays top of the post world DAW of choice. If you own Native Instrument’s Maschine then you will know there is a cool feature where you can drag and drop sequenced instruments from Maschine right into Pro Tools as frozen audio tracks. I is also possible to do this in a limited way in Transfuser and several other VIs. So if it’s possible in those products then it would be nice to see this extended to other parts of Pro Tools. This is just scratching the surface of what is possible by looking at other parts of the Avid Product portfolio, but for now these are simply in other products waiting to be ported to Pro Tools 11 - we hope Avid port them all!